The perception of sweetness decreases as product temperatures lower. The short and long of it: If a cocktail tastes juuuust sweet enough at room temperature, it will not taste sweet enough once you’ve shaken it with ice. I always tell class-goers of mine to taste their cocktail BEFORE adding ice, and then tweaking the sugar as they see fit. It’s not about if I like the amount of sweetness, but do they? 9 times out of 10 in class, when someone asks me to see if there’s something missing, I can “diagnose” it as a lack of sugar. Since so many recipes call for sugar in one form or another, I decided to compile a comprehensive list of sugar syrup recipes. They aren’t hard (some are fine to add as-is), but this is a handy list to refer to if you’re scratching your head as to how to make a certain syrup! I’ve also included some science or notes along with the recipe, and I also indicate if I wouldn’t particularly mix with a certain syrup (and why!). The easiest and blandest of syrups, this is just white sugar and water, making a clear syrup. NOTE FOR VEGANS: Not all sugar is vegan! Look for options labelled organic, as some non-organic brands use bone char (commonly used to refine cane sugar). You can either use the volume method (cups, Tbsp, etc. ), or if you want to be as precise as possible, use the weight method (use a scale)! Recipe: One part sugar to one part water (ex. if you’re adding one cup sugar, you need one cup water). Add into a small pot and slowly heat the water (stir every now and again) until the sugar dissolves, and the liquid looks clear. Let cool. Can be stored in a container (like a Ball Jar) for about a month in the fridge. Oftentimes, a recipe might call for something to be infused into your simple syrup, like fresh herbs. This will make your syrup have a lovely aromatic note and flavour. Recipe: The above recipe but also add… 1/4 - 1 cup of fresh herbs or spices (think black peppercorns); 2 Tbs. dry herbs/spices; OR 1/4 - 1/2 cup of fresh fruits/roots (think ginger). Once cool, strain (regular strainer or for smaller particles, cheesecloth) into a Ball Jar. Will keep for a month in the fridge. These recipes are a range of measurements so you can really make your syrups lighter in flavour to more intense. NOTE: Spices DO NOT dissolve in the syrup, so if you’re lazy and want to use spices, use whole (not powdered). More common in the UK, this is a 2:1 ratio of sugar to water. Richer in flavour and more viscous (read: thicker) and can keep longer in the fridge (about 6 months). I normally would use this in an Old Fashioned, or in any cocktail that feels a little thin (like a mojito). Recipe: Two (2) parts sugar to one (1) part water. Directions for cooking/cooling/storing are the same as simple syrup above. Often called agave nectar. The DARKER the colour, the less refined. Fine as-is from the bottle. If I use agave, I use in small amounts, and I don’t use often. NOTE: There was a lot of buzz back in the early 2000s about agave being a relatively “healthy” sweetener, esp. for diabetics, since it ranks pretty low on the glycemic index. Instead, agave can be high in fructose. Now, science has shown that the high amount of fructose in agave actually can promote obesity and harm liver function - oops. That being said, certain agave syrups have less fructose than others. Avoid blue agave nectars, as they have more inulin, which contains fructose. Fine right out of the bottle, maple syrup is made from boiling the sap of the sugar maple tree. It’s brown colour is actually a product of the Maillard reaction - or the browning effect that occurs when the sap is being boiled with high heat. I love maple in cocktails and think it’s a perfect substitute in autumn/winter cocktails! I love bees and I love honey. It is much more aromatic and has a distinctive flavour in cocktails. There are so many different kinds of honey with slightly different flavours, so you can really play with this one. Go grab local honey from the farmers market! Recipe: One (1) part honey to one (1) part water. Directions for cooking/cooling/storing are the same as simple syrup above. NOTE: I only use weight measurement for this, as honey is denser than granulated sugar. I place my small pot directly on my scale, tare it, and then add the honey and water in equal measures. Whether you’re using light brown, dark brown, or even granulated sugars like Demerara, Muscovado, Turbinado, these sugars can add depth and flavour to your drink, thanks to the varied molasses content. NOTE: Light Brown and Dark Brown sugars have nearly the same amount of molasses content (~10%), and many times the only reason Dark Brown sugar is darker, is because they add colour to it! ALWAYS use the weight method (use a scale) for this syrup. Recipe: One (1) part sugar to one (1) part water. Directions for cooking/cooling/storing are the same as simple syrup above. Sorghum is a plant from the grass family, and it has a really lovely depth as well as a brightness to its sweetness. I adore it in cocktails, and think it’s exceptionally good in those that use rye whiskeys. Recipe: One (1) part sorghum to one (1) part water. Directions for cooking/cooling/storing are the same as simple syrup above. I’m a citizen of the UK, and as an Englishwoman, Lyle’s Golden Syrup is in my pantry at all times. Used in baking, it can also be used in cocktails to give them a unique taste (and a quintessentially British one). This is an inverted sugar, meaning that it is made by adding acid to to sugar syrup, however it is not highly refined. It has a light caramelised flavour that is hard to describe…but soooo good! Fine right out of the bottle, but make sure you do a DRY shake (a shake of your wet ingredients BEFORE you add ice), to make sure it is dissolved into your other ingredients. Treacle is a dark cane syrup that is also popular in the UK. It’s a lot like molasses but I think it tastes just a bit different. I like to use Black Treacle in cocktails. GREAT for holiday cocktails and when you’re using intense spices (like clove, cinnamon, star anise, and black pepper) in your concoctions. Molasses is concentrated sugarcane juice, and out of all the sugars, contains the most essential minerals and B vitamins. It can come in many “grades,” but I’ve found that lower grade is more robust and can really make your cocktails pop. That being said, look for unsulfured brands! Normally used in baking, and derived from corn starch, I wouldn’t recommend using corn syrup in your cocktails. There are several liqueurs that have corn syrup (homemade Kahlua for one). Just use simple syrup. Have a great corn syrup cocktail recipe? Let me know in the comments! Liqueurs are awesome! Flavoured, low in alcoholic volume, and sugars added, they can be added instead of, or in addition to, the syrups above. Really, it’s all to taste. Some common liqueurs are Bailey’s Irish Cream, Kahlua, St-Germain, and Cointreau, but the world of liqueurs is changing. 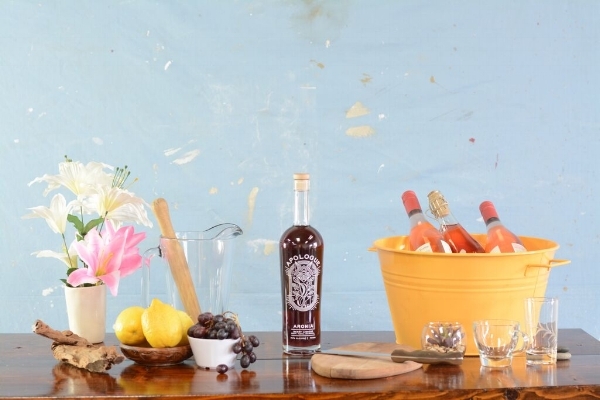 Check out Apologue for a fresh take on liqueurs! It will add a trigeminal sting of alcohol into your drink, but can be used right out of the bottle! Made from rice starch, rice syrup has a lovely lightness to it (kind of like sticky rice). Brown rice syrup is less refined and can usually be found in health stores. Normally used in baking, like in breads and crackers, malt syrups are made from sprouting grain, then concentrating a water-malt mixture with water, making a syrup. It can have a flavour similar to molasses, but I think it has a yeastier aroma and a more distinctive flavour. Fine right out of the bottle, but make sure you do a DRY shake (a shake of your wet ingredients BEFORE you add ice), to make sure it is dissolved into your other ingredients. You might find this syrup very heavy in flavour and possibly want to mix it with a simple syrup to start, or add small amounts to taste! Have another sugar you like to use in cocktails? Let me know!